I am going to stitch together the collar today. In order for a collar to turn out the way you like there is one important thing you have to make sure you do. Cut the collar on grain! That dark gray line shows the direction of the grain of the fabric. If you look at the shape of this collar or a peter pan collar you can see where this would provide an opportunity for trouble. The shape is semi-circular. There is no way to avoid encountering a bias when cutting out, handling or attaching this collar. The bias is there for a reason, it will help your collar lie flat as well as roll over the edge of your neckline. That bias can also be a pain in the ankle. (Or any other **a** word that comes to mind.) It will allow you to stretch the collar out of shape and off grain. Ever wonder why two collar pieces from the same pattern piece come out two different sizes? Even when you have cut them at the same time? Because in the handling or stitching you stretched one and didn't know it. I learned this method of collars from Gail Doane. Her philospophy is, if you don't encounter the cut edge of the bias, you can't stretch it. I have become a follower of this philosophy. 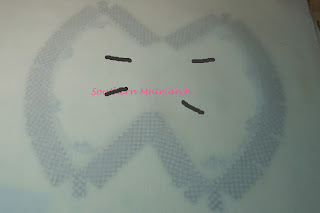 So here is how to construct the collars in a block. Both collar pieces are traced onto the fabric, keeping the straight of grain in mind. I embroidered it in a block. Now I will construct the collars in a block without cutting them out first. I interface my collars with something called German interfacing. It is a woven fusible interfacing, that does not bubble or crinkle after your garment is washed. 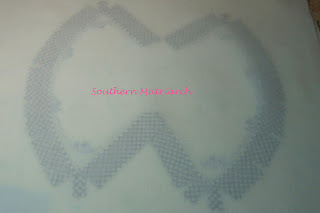 (It is shown here after my piping was applied because I forgot to take a picture until then. Pretend you don't see the piping.) It is imported/distributed by Debbie Glenn of Love and Stitches and is available at most heirloom shops. Yes it is more expensive than Pellon, (I HATE Pellon, with a passion!) but it outperforms it by far. I bought 2 yards and it has taken me almost 5 years to use it up. Yes it might cost more, but sometimes the cost is worth it. I only use it for collars, cuffs, button bands and yokes, so it lasts a long time. I am not making a prom dress out of it. This collar will be piped. So another handy sewing tool, GLUE! Yes glue. I am only going to use four pins while constructing this collar. First I have made my piping and cut the piping seam allowance to match the seam allowance of my collar, which in this case is 5/8". I match the raw edge of my piping to the TRACED edge of my collar and glue that puppy down. 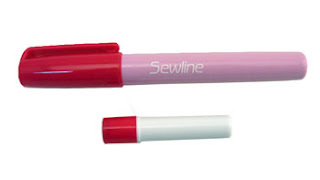 I am using for the first time a Sew Line Water Soluble Glue Pen. I purchased mine at BessieMary the last time I ordered fabric. I will review it at a later date. I am a big fan of glue. It negates the need for pins. Pinning around that cut edge of the collar is another chance to stretch it inadvertently. So glue it is. When you get to the corners of your collar, snip that seam allowance really close to your stitching. I have a son in law with a really annoying saying. "Its a physics thing." You have to release the pull on that seam allowance for the piping to turn the corner. No this is not too close. I almost could have snipped a teeny bit closer. This is the wrong side of the collar with the piping glued on. You can see that the raw edge of the piping meets the traced edge of the collar. You can just make out the shadow of the piping seam, it falls right along the seam line of my collar. 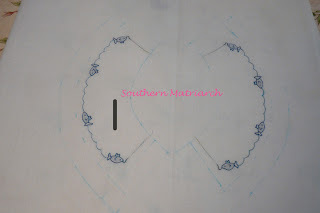 I could have skipped this step since my piping is glued down, but to illustrate the steps of making the collar, I included it. 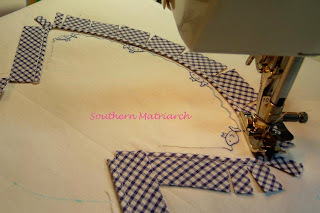 I am stitching down my piping to my collar pieces. I use an edge joining foot for my Bernina. If you don't have an edge joining foot specific to your machine, Nancy's Notions sells a generic edge joining foot. Worth its weight in gold! If you enlarge the picture you can see that the blade of my foot is riding just inside of the stitching made from making the piping. 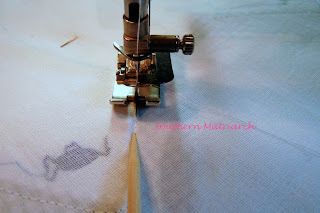 When approaching the corner, shorten your stitch length and pivot slowly around the corner. The shortened stitch length allows you to make a smoother turn around the corner. Again that physics thing. 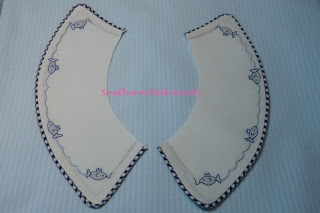 Continue with both collar pieces. This is the back of the collar after the piping has been stitched down. Make sure you collar lining piece is pressed smooth and is also cut on grain. With right sides together, lengthwise grain matching, place your collar lining piece on top of your prepared collar. You will have a collar sandwich. Collar, piping, lining. I neglected to take a picture of this but if I had, this is what it would look like. I don't want the center to shift as I stitch my collar sandwich so this is where I placed the four pins. Stitching from the piped collar side of my collar sandwich I am going to use my previous stitching and my handy bamboo skewer to stitch my sandwich together. 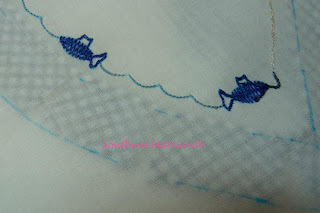 I actually "draw" a line in the fabric INSIDE that first stitching with my skewer. Then the blade of my edge joining foot rides right along that groove I drew. 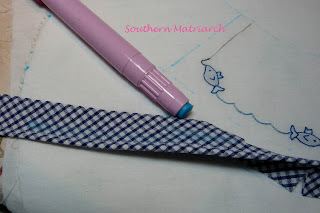 This helps me to not have that previous stitching peeking through when I turn my collar. Remembering to shorten your stitch length to about 1.5 and pivot around the corners, stitch both collar pieces. see those three teeny stitches at the corner? Gahhh! But they are gone now. 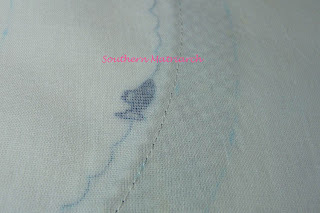 Next I bump my needle over 1/8" (for my machine that is two steps) and stitch a second line of stitching. Again I ride my blade along the first stitching and since I moved my needle it allows me an even 1/8" second seam without having to watch where I stitch. I am using that blade of the foot to guide it. Now I am going to cut out the collars. I trim RIGHT UP NEXT to that second stitching. Giving me that 1/8" finished seam allowance. I AM NOT GOING TO CLIP THIS SEAM ALLOWANCE! Did you hear that? I was hollering on purpose. I then turn the collar right side out as shown in the top collar piece. Completed, non puckering, flat, smooth and even collars. Ready to attach to my neckline. I hope this helps and if you ever get a chance to take a class from Gail Doane, DO IT! 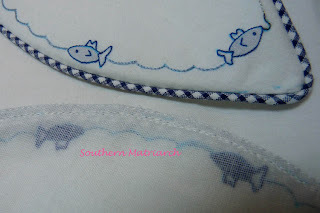 Excellent tutorial on how to make a good looking peter pan collar. I too am a big fan of glue. I've been using Roxanne's glue baste-it since I tried making Kari Mecca's Sherrie's Cherries dress but I think I'm going to get hold of one of those glue pens. This is by far, one of my most favoritest outfits I ever made for any of the boys. Love it! I think I put this collar on a CC Sandy...and the last two boys wore the heck out of it. Thanks for the awesome tutorial. Lucky baby. I guess I need to get me a glue stick. What great directions. That glue pen looks pretty cool. I am learning sooooooo much from you. 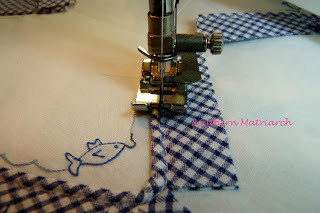 I've been sewing for years and years and years, but there's always something new to learn!! Thank you!!! Oh my WORD! I LOVE this! Thanks soooooo much for sharing your wonderfully, detailed instructions! Thanks for posting this wonderful tutorial! Martha...I love the colors of this sweet little outfit!!! And I too love my Bernina edgestitch foot!!! I use it ALL the time!!! 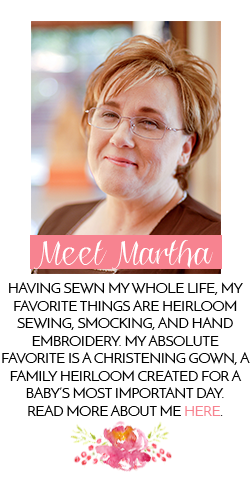 This is a fantastic teaching post, Martha! I've read it & re-read it. I wish I could sit at your elbow & watch you do it, too. This is a wonderful tutorial, Martha. The only thing better would be to get to be with you as you do it. Oh my. I love your tutes!! I wish I lived nearby, so I could absorb anything and everything! Oh, to be a fly on the wall of your sewing room. I always thought using glue was cheating...now I see I was cheating myself. Thank you again! 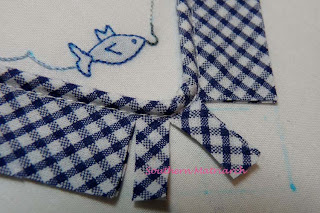 Is the pattern for the adorable fish on the collar of the gingham bubble available? It is a design that was in Creative Needle Magazine May/June 2003. Sometimes old issues of Creative Needle come up on ebay or etsy. This is an interesting technique that I'm anxious to try! Thanks for the nice tutorial!! Would the pro sheer elegance interfacing work as well as the German? I get it from fashion sewing supply. Love the tutorial. I'm going to give this a try this weekend and I already have the sheer elegance. Thank You!